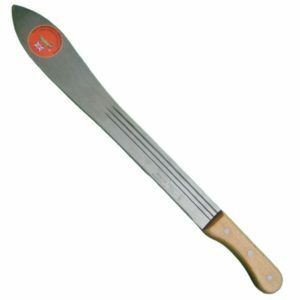 We carry all the best models and brands of machetes from all over the world, but with so many to choose from, everyone wants to know where to get the best chop for their buck. In this article, we’ve picked our Top 25 Tried-And-True Machetes of 2018. For more information on finding the right machete for the job, check out our machete buying guide; including information on the different types of machetes, blade materials, handle styles, and tips for beginners. This truly is a beautiful machete from Condor Tool & Knife. The black powder epoxy 1075 high carbon steel blade comes razor sharp right out of the box. Its 14-inch length (19-inch overall) makes it extremely versatile and easy to wield. It has good weight and is perfectly balanced. Perfect for chopping through thick branches and green vegetation. It looks so nice, you almost won’t want to take it out and get it dirty. Almost. 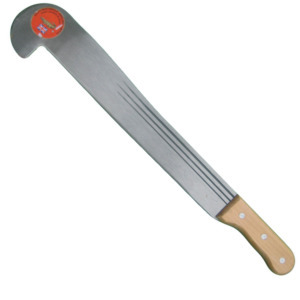 It may not look like much, but Tramontina makes a true workman’s machete. Don’t let the ridiculously low price point fool you, this is a quality machete made out of good 1070 carbon steel that is tough enough to handle any job. The blade comes a bit dull from the factory, but sharpens easily season after season. Some of our customers have been known to whittle down the wooden handle to custom fit their grip. Comes in 18″, 14″ or 12″ models. Ka-Bar makes one of the best kukris on the market. With an 11.5-inch (17-inch total length) black epoxy powder 1085 carbon steel blade, this compact tool wields serious chopping power. Ideal for cutting weeds and clearing campsites. It also comes with a leather and Codura sheath. 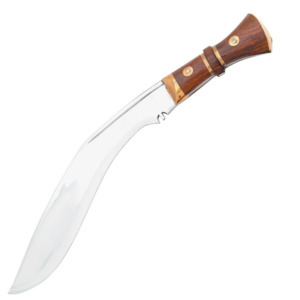 We carry a wide selection of kukri machetes. This massive 27-inch (32-inch total length) colima machete from Imacasa will make short work of any field. The blade is sharpened on both sides so you can cut with both the fore- and back-hand swings, and the bulged spine is designed to add power to the normally weaker backstroke. 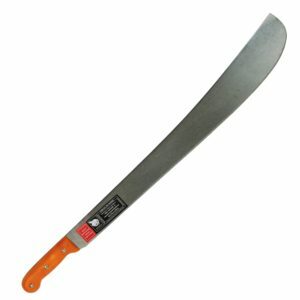 This machete is staple for many agricultural and landscaping companies. Cold Steel is known for producing quality, reliable machetes, and their take on the classic Latin-style machete is no exception. 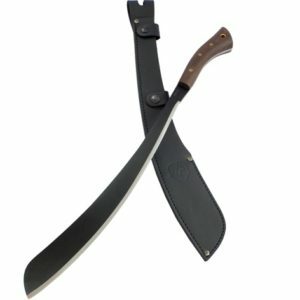 With its tough 18-inch 1055 high-carbon steel blade with black anti-rust finish and comfortable polypropylene handle, there’s not much more you could ask for in a machete. At $19.99, it’s practically a steal. This compact all-purpose tactical machete from Ontario Knife Company packs a lot of punch. It features a 10-inch 1095 High Carbon Steel black epoxy blade with a wedged tip and saw-toothed back, making the SP8 extremely versatile. No camp pack or bug-out bag is complete without one. 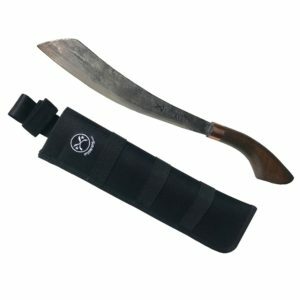 A MacheteSpecialists.com exclusive! 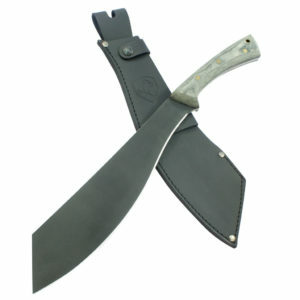 Made in Ecuador, Hansa brand machetes cannot be found anywhere else in the North America except on this site. 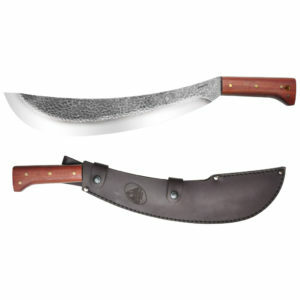 This hefty 24-inch machete is popular as an agricultural tool for farmers in the Andes region of South America, as well as a standard issue survival tool for the Ecuadorian Special Forces. Hand-forged by the renowned Bidor blacksmiths, this particular style was made popular by the famous outdoorsman Ray Mears. 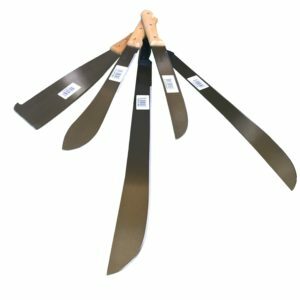 The tempered 5160 Spring Steel blade has a remarkable ability to keep a sharp edge, even after heavy use. 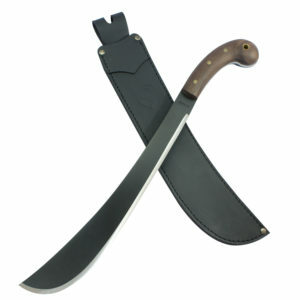 Machete Specialists has a wide variety of parang machetes available. This thing is a BEAST. The All Terrain Chopper from Cold Steel has been put through many grueling performance tests and come out shining. Not so much a machete as it is a 21.5-inch 1055 high carbon steel demon love-child between a sword and an axe, it will cut through branches like butter. If the job is big, the ATC won’t let you down. 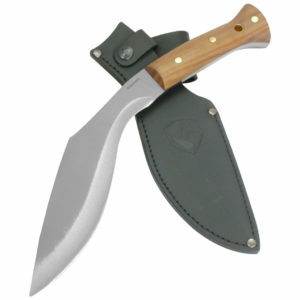 Rounding out our list is the Mini Duku Parang from Condor Tool & Knife. Like all Condor machetes, it comes with incredibly high quality steel and a beautiful finish. At 10.5 inches, it is lightweight and feels good in hand. Comes from the factory sharp enough to slice paper, but bites deep into branches just as easily. Another great Condor blade. Find your perfect machete today!